Every day, it seems, our modes of transportation become more like high-tech companions, geared to enhance our comfort and safety while providing vital real-time information. 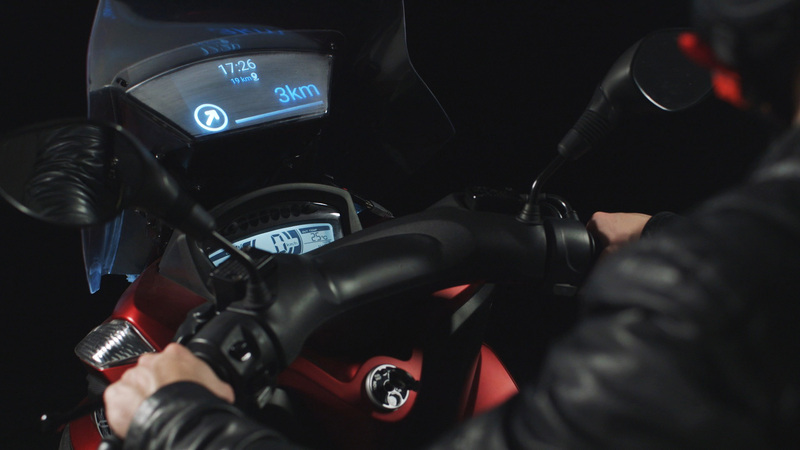 The latest example comes from Italy, where Samsung partnered with Leo Burnett, motocross star Edo Mossi and local YouTube influencer Cane Secco to develop a "Smart Windshield" prototype for motorcycles. Fitted on a Yamaha Tricity 125 scooter in the video below, the screen accesses smartphone information through a connected app, displaying voice calls, social messages, emails and such, while riders keep their hands on the grips and their eyes (mostly) on the road. When messages flash on screen, you can choose to pull over and engage, or the system can send an automatic "I'm driving" reply. Set below the bike's actual windscreen, the Smart Windshield also shows GPS navigation data. In Italy, smartphone use contributes to 25 percent of accidents among young motorists, Burnett says, so the Smart Windscreen was designed to appeal to tech-savvy millennials seeking enhanced safety. Samsung and Burnett have driven down this road before. Notable efforts have included a life-saving truck-screen system in Argentina (winner of numerous prizes, including Adweek's 2015 Project Isaac Gravity Award for innovation), and 2014's "Smart Bike" concept for Italy. In a broader sense, such concepts point toward a (very near) future where passengers and vehicles are always in sync as they share the ride. The counterargument to this particular innovation is that it's probably safest not to check emails or texts at all, in any form, while driving—though that's probably wishful thinking these says. Hey, if self-driving scooters someday allow us to browse the Internet, snack or even snooze while we zip down the highway, well, maybe humanity is better off if the machines win the battle for global supremacy after all.